Don't you dare throw that dingy old shower curtain in the bin! 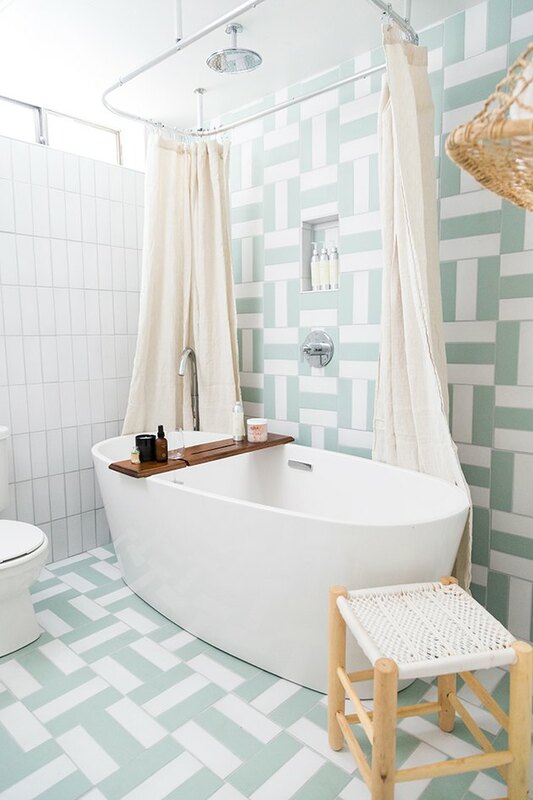 We get it, it's tempting, but you could just as easily clean it yourself rather than going through the hassle of scrolling through pages and pages of shower curtain pattern-explosion online or settling for whatever is in store. You'll not only save money in the long run by reusing what you already have, but also help lessen your own carbon footprint, you eco-friendly warrior, you. Plastic or vinyl, linen or polyester, here are a few tips for how to give your shower curtain a proper clean (and liner, too). Spoiler: The vast majority of shower curtains, no matter the material, can easily be cleaned in a washing machine. But if yours is hand-wash only, you can scrub it down with a mild mixture of baking soda and warm water. Now, let's get down to the nitty-gritty. Throw a plastic or vinyl curtain, believe it or not, right into your washing machine on the highest water and cleaning level with your normal amount of detergent, then add half a cup to a cup of baking soda (depending on the size). Wash in warm water. Add in a couple of clean white bath towels to the mix for extra cleaning agitation. And because you are an A+ student, add about a half cup to a cup of distilled white white vinegar during the rinse cycle just like you would fabric softener. Pro Tip: Be sure to remove any metal hooks on the shower curtain before washing. The final step is to hang dry either right back on the rod in the bathroom or outside in partial shade, but never put a shower curtain or liner in the dryer. This includes anything like cotton, linen, silk, nylon, polyester, or hemp materials, and this might seem obvious, but it's best to wash your shower curtain based on the specific care called for by the material. Detailed instructions are usually found on the care label and should be followed pretty much exactly for best results. Generally, if you are washing something that is 100 percent natural fibers, like cotton, linen, or hemp, cold or cool water is best to avoid shrinking, while nylon and polyester are more forgiving and can withstand higher temperatures. If your shower curtain material calls for hand-washing, simply dampen a clean microfiber cloth and sprinkle it with baking soda so the cloth is coated in a light, even layer and use to lightly scrub down the curtain. Rinse with warm water using a clean cloth to remove the baking soda until all traces are gone. To deep clean, get your cloth damp again and sprinkle it with more baking soda. Scrub out any set-in soap stains or mildew. Rinse again thoroughly. Work smarter, not harder by taking simple preventative measures to stop mildew (or the gross pink stuff) from forming in the first place. Practice good habits like always leaving the bathroom door open during and especially after showering to allow moisture out. Open any windows and turn on the exhaust fan while showering to help release trapped moisture. And don't forget to pry the outer curtain from the liner when you finish showering to let it air out. Go one step further and spray down your shower curtain with a mixture of half water, half vinegar after each use to remove soap scum and mildew that can easily build up, especially toward the bottom. And use body wash over scum-causing bar soaps. Good cleaning practice is to spot test any cleaner first, no matter the application. So, before applying detergents, cleaners, or bleach to your shower curtain, test it on the curtain first (somewhere hidden or less obvious). If you notice any discoloration or damage, opt for something else.